With Christmas around the corner, I thought it was time to create a healthy table snack of Thermomix Nuts. Preheat oven to 150°C fan-forced. Insert butterfly into a clean, dry mixer bowl. Add egg white and whip for 1 min/speed 4/MC on. Add remaining ingredients and combine for 15 sec/speed 2/MC on. Remove almond mixture to a baking tray, spread in a single layer. Bake in the oven for 10-15 mins or until golden brown, carefully stirring half way through. Allow to cool completely before serving. Is there a way to make this egg free? very nice I made for a pre Christmas get together with friends and gave away extras to everyone. Another hit. 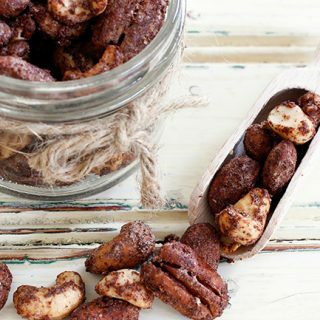 about to make them again with just pecans as I have a big bag to use up- thanks to shopping at Costco! 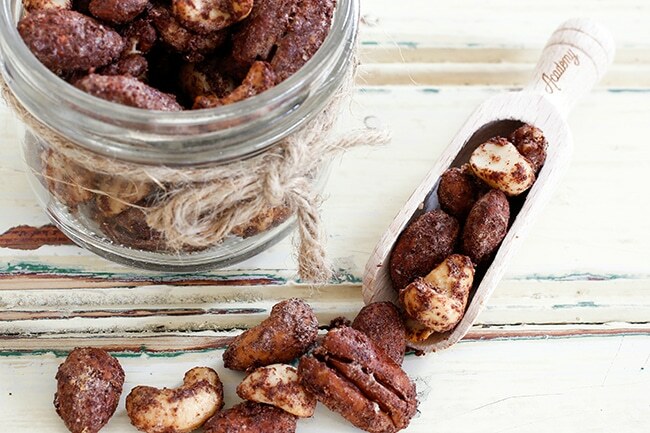 These nuts are so easy and delicious! The hardest part is probably seperating the egg yolk & white! I used half stevia and half raw sugar, omitted the pecans but bumped up to 200g of the other nuts. I think the mix could easily coat 250grams of nuts. Another tasty and easy recipe from Nik! These are so delicious. I had to stop myself from eating them all so I’d have some left for Christmas Day.